First published in 1989, this book considers Bertrand Russell’s philosophy through his correspondence with others. Indeed, his exchanges with his elders in philosophy, with his contemporaries, and with one of his most outstanding pupils are brought to life in this judicious exposition: meticulously documented before being judged with insight and sympathy, as well as impartiality. 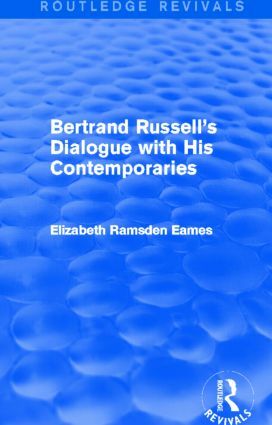 Elizabeth Ramsden Eames here explores the issues that emerged from Russell’s exchanges with certain other philosophers, and interprets the resulting reciprocal influences and reactions. The conversations presented cover subjects such as: the nature of relations; pluralism versus monism; the relation of the subject and object in knowledge; the analysis of experience; the definition of truth; the analysis of belief; and the theory of meaning. These have been in the forefront of philosophical discussion in our time, and Russell’s dialogue with his contemporaries promises to illumine them.